Lt. Gov. Osbert Potter at a November news conference. Potter spoke Wednesday about insurance. 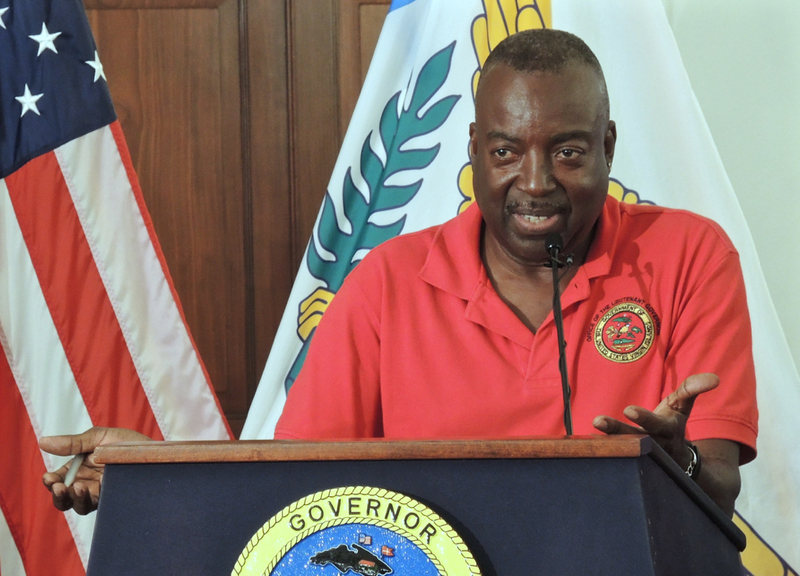 The Division of Banking, Insurance and Financial Regulation recently issued a bulletin placing responsibility on insurers to inform customers if they are underinsured, according to the Office of the Lieutenant Governor. Under V.I. law, Lt. Gov. Osbert Potter oversees an array of government functions and is commissioner of insurance. Potter held a news conference Tuesday at Government House on St. Thomas announcing the bulletin and giving some clarification on many concerns that policyholders were having filing claims, specifically as it pertains to damages from Hurricane Irma and Hurricane Maria. From Hurricane Irma, there have been 9,332 total claims reported, with 3,032 closed with payment. A total of $435.6 million has been paid in claims and 38 percent of claims have been paid, according to the Office of the Lieutenant Governor. From Hurricane Maria, there have been 5,549 claims reported, with 1,312 closed with payment so far. About $82.8 million has been paid out and 32 percent of the claims are closed. Potter said the division has been consistently processing customer complaints on challenges that they have been experiencing from their insurance companies, banks, and contractors. According to his office, one of the major challenges is the issue of underinsurance, which is insurance coverage that is insufficient to cover the total dollar amount of losses. Generally, underinsurance means the policyholder’s coverage is less than 80 percent of the property’s replacement value. “If you have insurance, it is very important that you take the time to fully understand your insurance policy and to ascertain that windstorm coverage should never be excluded on your policy,” Potter said in a statement. Potter signed a bulletin Jan. 23 that placed the responsibility on insurance companies, agents and representatives to notify their policyholders of underinsurance. All property and casualty insurance companies licensed and authorized to conduct insurance business in the territory must require each homeowner policyholder to sign a notice of underinsurance. Potter also said the territory has a policy, enforced by the division, that an insurance company is required to respond to customers within 30 days after the adjuster visits the property to conduct an assessment. Since hurricanes Irma and Maria in September, the division has processed more than 1,000 customer complaints, according to the Office of the Lieutenant Governor. Potter asked policyholders to first notify their bank if problems exist when a check is issued in the name of the insured and the contractor. If the problem is not resolved by the bank, policyholders should come to the Division to file a complaint. Customers with concerns regarding contractors should call the Department of Licensing and Consumer Affairs or the Department of Planning and Natural Division. Customers can visit the Division of Banking, Insurance, and Financial Regulation in St. Thomas at Nisky Center, second floor or call 340774-7166; or in St. Croix at 1131 King Street Christiansted, or call 340-773-6459.